Edison forgot one key element…procrastination, (at least in my case). I have been dealing with these three verbs since my last blog post. I’ll have to take you back a few weeks. I get inspired pretty easy to make items for people I love, and for people they love, and so on, but I also tend to procrastinate, which in turn, causes me to perspirate! I was busy thinking about Mother’s Day, and my wonderful mother who has an immense earring collection! Seriously, she was brought in as a guest speaker to a 4th grade classroom to display her earrings from around the world for a geography lesson. I wanted to make her something she didn’t have, uhh not easy! And wham! 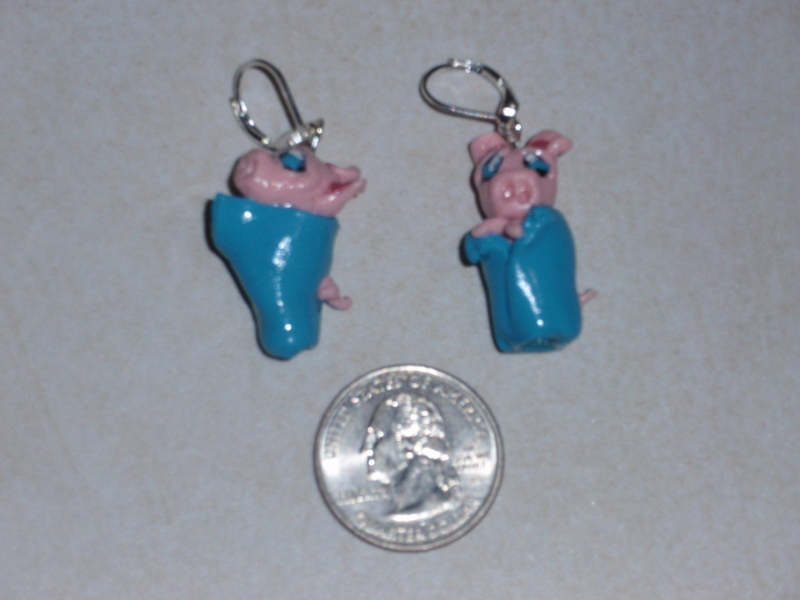 in the middle of the night inspiration struck, and I decided to make her pigs in a blanket! My mom has a wonderful sense of humor! Then I had my daughter, she and I have matching cherry blossom tattoos which we got to celebrate her 21st birthday. 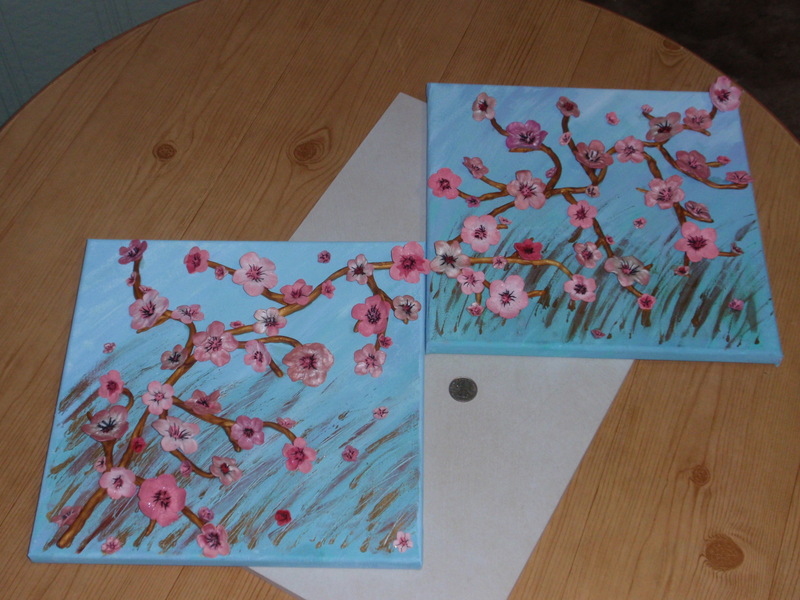 The above 3D art canvas of a cherry blossom branch extending across the two canvases I made for her. Then I had my bf whose mother likes owls, and who found a polymer clay book for me; even though, I have never met her before. So, of course, she had to have something from me for Mother’s Day. Needless to say, this little guy was just delivered yesterday! 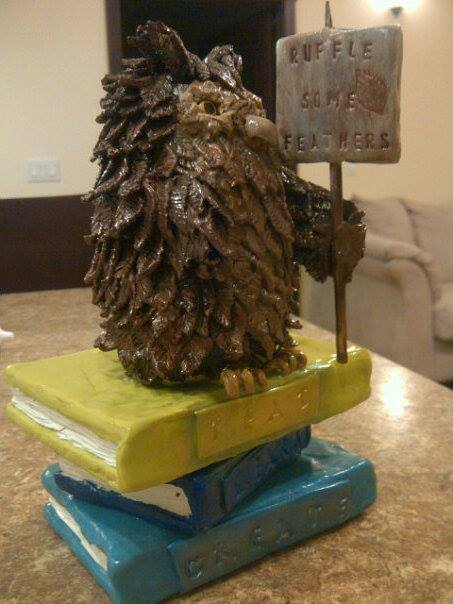 Here we are again, I was inspired to make a very detailed figurine (just the feathers took a couple of days), and I procrastinated, and i definitely perspired! Then of course there was my daughter’s mother-in-law and grandmother-in-law and my aunt who each got sculpted pens. And, what happened with my poor mother for Mother’s Day? I questioned my decision and decided to make her a second “nicer” item and…she as of now has gotten nothing!!! I love her so much, and I really let her down because of 3 verbs, no wait one verb, no that’s not right, 2 verbs, inspiration and procrastination. Why inspiration? I have learned that I can’t always do everything that pops into my head. 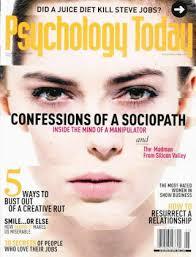 If I tried I would be crazier than I am now! Dragons!!! The creative voice is a funny thing…or maybe it’s just me? 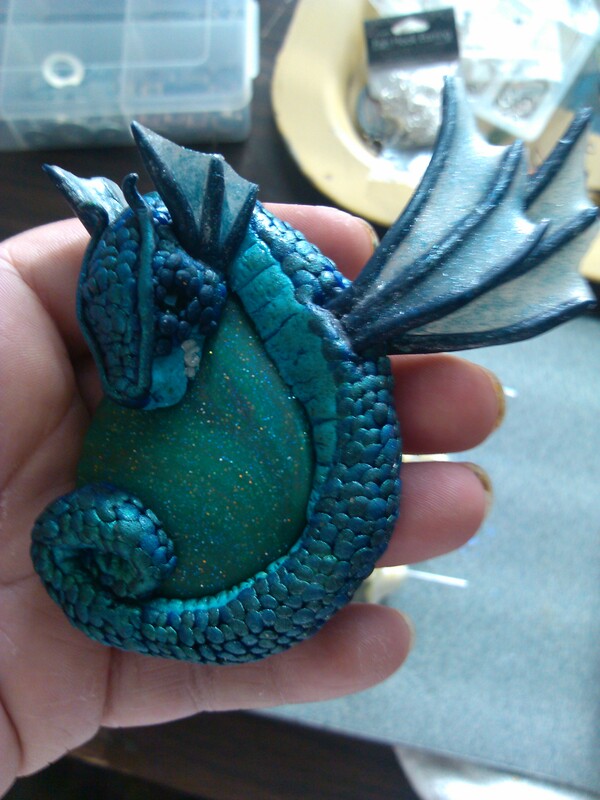 This post features 3 other dragon items I’ve made. Each of them features very detailed (tedious) scale work. Each item: a pendant, cuff bracelet and ring were created by hand-forming each individual scale. This is not a sales pitch, although if you we’re interested in any of the items, that would be nice! I described the scales and featured these particular items to get to my focus today, the creative process. It really is a funny thing. I’ve never been particularly interested in dragons. I admit I’ve played a game or two of dungeons and dragons back in the day, but they really had nothing to do with dragons at all. As a matter of fact I have a terrible phobia of snakes, as many people do, and am therefore leary of most things reptilian. So why in the world am I making dragons? I’ve come to the conclusion that it is the creative process, more specifically the creative voice inside of me whispering to my subconscious (this is what you need to bring to life today) needs to do this. But why? It is human nature to dream, hope, wish, fantasize, create and share. The various ways in which we do it are as vast as the universe, but we all do it. My creative process has taken me down many roads as a teacher, mentor, actress, and on and on, but nothing has quite grabbed hold of my soul like the gift of creating tangible art. Somewhere inside I’ve had these little dragons yearning to be set free. What an incredible feeling! My call to action to you is to do some soul searching and try something new, something that you never thought you would be capable of. I never thought of myself as an artist because I don’t draw. What a narrow-minded way of tthinking! If I wouldn’t have tried polymer clay I never would have tapped into that creative voice. And that , my friends, would have been a very sad world for me and my dragons.